Article first published as Creamy Fruit Mini Pies on Blogcritics. The texture of food is something I pay close attention to, even moreso when my son's involved. He currently prefers food that has some body to it where he can bite and chew. Gone are the days of smooth purees for this little guy! I've been on the same wavelength and was craving a dessert that was creamy, fruity and had some bite. What I came up with were these Creamy Fruit Mini Pies. A creamy filling studded with chopped fruit fills up mini graham cracker crumb crusts for a perfect little pie. 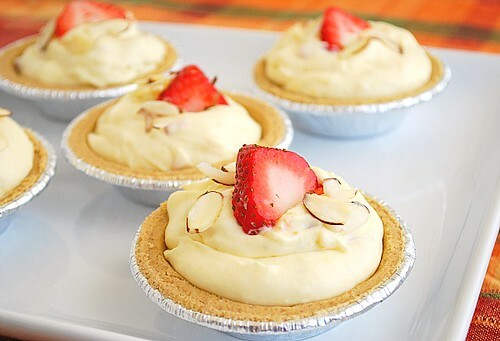 These little cream pies take advantage of fresh fruits in season or on sale. Chop up the fruit into a small dice and fold them into a simple cream filling made with cream cheese and whipped cream. For the ones I've made, I used fresh strawberries and canned peaches. I look forward to making these again with fresh peaches later this summer. You could try this with other fruit such as mango, pineapple, raspberries, blueberries, etc. It's a versatile recipe that you can tweak to your tastes! In the bowl of a stand mixer with the whip attachment, whip heavy cream until medium peaks. Combine cream cheese, sugar and lemon juice; beat until smooth and creamy. Fold cream cheese mixture into the whipped cream with the chopped fruit and zest. Pour into the mini graham cracker crusts; chill until firm, about 2-3 hours. Garnish with slices of strawberry and sliced almonds before serving.